At least 69 people have died in a huge blaze that tore through apartment buildings also used as chemical warehouses in an old part of the Bangladeshi capital Dhaka, fire officials said Thursday. Dozens of people were trapped in the buildings, unable to escape onto narrow streets clogged with traffic, as the highly combustible stores of chemicals, body sprays and plastic granules erupted in flames. 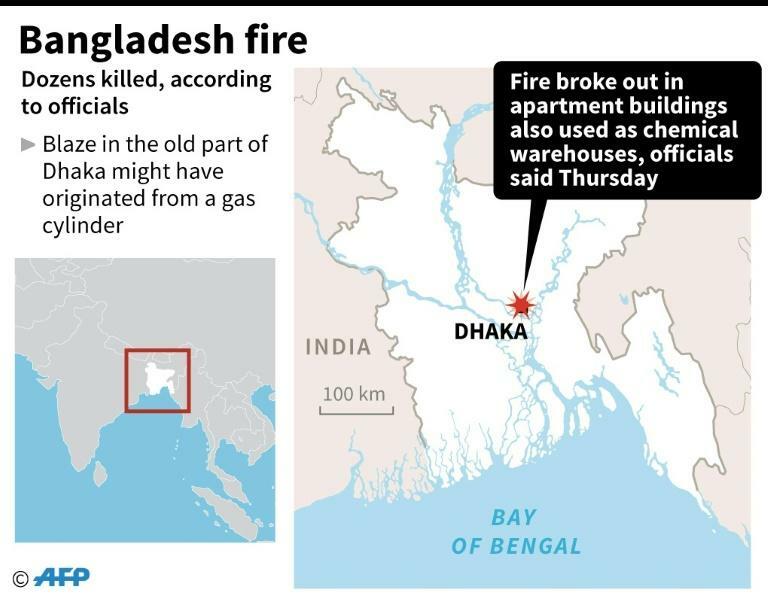 Fire control room official Mahfuz Riben told AFP that 69 people had been killed while Bangladesh's fire service chief Ali Ahmed said the death toll could rise further. "The number of bodies may increase. The search is still going on," he told AFP. Ahmed said the blaze at Chawkbazar in the old part of the city may have started with a gas cylinder before quickly spreading through a building where chemicals were stored. The flames raced through four adjoining buildings, which were also used as chemical warehouses. "There was a traffic jam when the fire broke out. It spread so quickly that people could not escape," he said, describing a part of town where the streets are very narrow and residential buildings stand just centimetres apart. Another fire official told reporters the blaze, which began around 10.40pm (16:40 GMT) on Wednesday, has been "confined" but not yet extinguished despite the efforts of more than 200 firefighters. "It will take time. This is not like any other fire," he said, adding the inferno became so devastating due to the "highly combustible" chemicals stored there. TV images showed the main gate of one of the buildings was locked, leaving its residents trapped, unable to escape the blaze as it swept through its five storeys. Witnesses said members of a bridal party in a nearby community centre were also caught in the fire and many of them were injured. Deputy commissioner of Dhaka Metropolitan Police Ibrahim Khan said at least two cars and 10 cycle rickshaws were burned in the fire. "The victims included passersby, some people who were eating food at a restaurants and some members of the bridal party," he said. Television images showed firefighters climbing ladders to try to spray water on one of the buildings where the fire had largely been contained. One helicopter was also seen hovering over the area. Bacchu Mia, a police inspector at the Dhaka Medical College Hospital said at least 45 people were injured, including four who were in critical condition. Hundreds of people rushed to the hospital to look for missing relatives. Haji Abdul Kader, whose shop was destroyed in the fire, said he only survived the blaze as as he had left the shop to go to a pharmacy. "When I was at the pharmacy, I heard a big bang. I turned back and saw the whole street, which was jam packed with cars and rickshaws, in flames. Flames were everywhere," he told AFP. "I got burned and rushed to hospital," he said. Sohag Hossain, one of the injured, told the Daily Star that he and two of his friends were working at a plastic factory in one of the buildings at the time of the fire. Suddenly, they heard a huge noise. They tried to flee but could not escape the fire. A similar blaze in 2010 in an old Dhaka building, which was also used as a chemical warehouse, killed more than 120 people in one of the worst fire-related disasters in Dhaka. Dhaka city authorities launched a crackdown on chemical warehouses in residential areas following the blaze, but efforts to rein in the practice have waned in recent years.